On September 16th, 2016, I observed and documented a banded Great Black-backed Gull at Nickerson Beach on Long Island. Research on the banding data for 8V2 revealed that the bird was banded as a chick at a nest on Appledore Island in Maine July 18, 2012. My resight was the first for this bird since banding. I am way behind on blog posts and I apologize to my faithful readers who have tolerated my tardiness. The one post that I must get to, is on the 2016 Shorebird Season at Jamaica Bay Wildlife Refuge. The past few seasons were filled with issues (like 2011) relating to the water level management on the East Pond and this season was not without some of that. Every season since 2009, I have kept an eye on the water level management on the East Pond documenting the pond draw down process, the timing of the drainage and how much the pond needs to be lowered to facilitate the timing of the arriving Shorebird migrants. National Park Service has often times dropped the ball in managing the water level and this is when my knowledge pays off as I could quickly detect when something is amiss with the water flow. Often times than not, I get resistance as those in charge are reluctant to admit when there is an issue but persistence pays and it appears recent changes in management structure is paying dividends in terms of response time. The East Pond was lowered quite a bit this season and I hope this aids in getting the pond to be more of a fresh water habitat than it is at the moment. Hurricane Sandy in 2013 had breached the East Pond and the salinity level was adversely affected but within a year had reached reasonable levels and continued to drop ever since. With the lowering of the water level, we had ample shoreline for birds but for whatever reasons, I found the numbers to be off from the thousands of birds we usually get stacked up on the pond. It is important to note that the historic data seems to indicate a downward trend in terms of volume. Something to keep an eye on and worth digging into more deeply for a deep dive analysis while keeping in mind that Hurricane Sandy opened up more feeding habitat in areas like Ruffle Bar, Little Egg and Big Egg Marsh. Other than an early Ruff in June, there was nothing else noteworthy that was recorded on the pond for shorebirds. 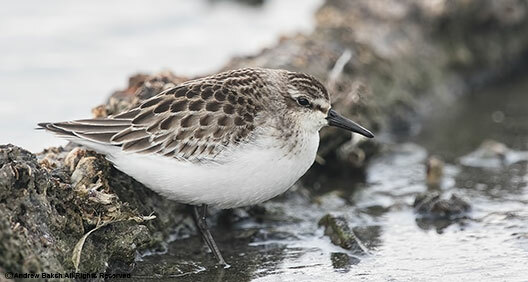 This year, it appeared we missed American Avocets and Buff-breasted Sandpipers. Neither of which are guaranteed but we do get them. Marbled Godwits were seen in the bay but only one recorded on the pond giving suspicion that there are other habitats outside of the East Pond that shorebirds might be using during migration. I continue to look for late shorebird migrants on the East Pond and as such, did manage to pickup a couple of Long-billed Dowitchers in September. Always a treat to see. Hopefully, I will get an odd bird or two in October through November as I still hold out hope for late Shorebird migrants. As of this post, the 2016 Shorebird Season on the East Pond at Jamaica Bay will be noted as mediocre.